Published June 16, 2016 By Guest This post may contain affiliate links. Regardless, I only recommend sites I've researched and/or used and trust. You’re a blogger and the time has come when you’re ready to earn money with your blog. So, how do you actually go about making money with your blog? Let’s talk affiliate programs! An affiliate program is a program where you, the affiliate, get paid for promoting a merchant’s products or services. 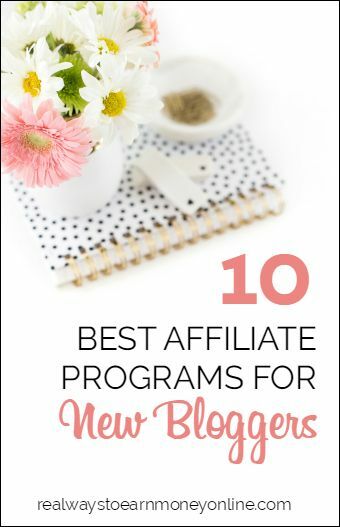 You can promote in a number of different ways including text links on your blog, web banners, sidebar content, and more (permitted promotion methods vary according to the affiliate program). SiteGround is a web hosting company. I learned about SiteGround several years ago when I used them to host a small site I owned at the time. I have used other hosting companies since then but SiteGround is the best, by far. They offer a super simple affiliate sign up process and have a generous $65 per referral affiliate program! You can monitor your clicks, signups, and earnings from their easy to navigate affiliate dashboard. Totally newbie approved. Shareasale is an affiliate network that offers pay-per-click, pay-per-lead, and pay-per-sale programs. This means you get paid by clicks, leads, and sales. You sign up to be a publisher and you’ll have access to their entire network. You can search and apply to as many merchant affiliate programs as you like, including Shareasale’s own affiliate program which offers a per lead ($1.00 per lead) and per sale ($100 per sale) option. What you’ll love about being a part of their network is that you can manage all your Shareasale affiliate partnerships within their site. Shopify is THE platform for building a website. Granted, I’ve operated 2 or 3 stores on their platform in the past so I’m a bit biased but really, their store platform is pretty amazing. They have everything you need to set up a successful online store. Equally as amazing is their affiliate program. I applied for Shopify’s affiliate program, offering a generous opportunity to earn up to $2,400 per sale, when my blog was less than a month old and was APPROVED! It’s so easy to use their referral tools to generate leads and sales. Highly recommended. Chitika works similarly to Viglink. Signup is a breeze. You add the WordPress plugin for Chitika and that’s it! Sit back and monitor your stats from your Chitika.com dashboard. That’s it! This company is an affiliate network, similar to Shareasale. Their dashboard is super user-friendly. You can search for advertisers and apply to be part of their affiliate program direct from the site. They have tons and tons of advertisers, perfect for every niche! THE destination for email marketing campaigns. I’ve worked with several email marketing companies and ConvertKit has been the best, by far. What you’ll love about their affiliate program? SendInBlue is an awesome destination for creating newsletters! Free plan for up to 9000/emails a month for YOU to try out! BANNERS: I use banners primarily in the sidebar. Chitika will place some banners within my blog posts as well. When you start implementing banners, you can put them in the top bar, bottom, and in your sidebar. TEXT LINKS: I use text links everywhere. They are very easy to insert into your content wherever you like. You can even track them using bit.ly if you want to track the click-through in various posts or locations. Great article – our company, namoffers is a big fan of Impact Radius for affiliate programs too – similar to CommissionJunction & ShareASale, but different brands.